Nokia 3720, a stylish IP-54 certified mobile phone designed to resist water, dust and shock. The 3720 classic handset is encased in durable materials and is entirely sealed to protect the inner electronics. It also incorporates a 2.0 Megapixel digital camera with 4x digital zoom and a torch light. The Nokia 3720 SIM Free phone works on all UK Networks with any SIM (contract or Pay As You Go) including Virgin, Orange, T Mobile, O2 and Vodafone. It will not work on the Three Network. The Nokia 3720 classic is a robust, reliable, and easy-to-use device that helps you capture and share life's special moments. The body of the handset is made of stainless steel elements, sealed materials and rough textured surface. 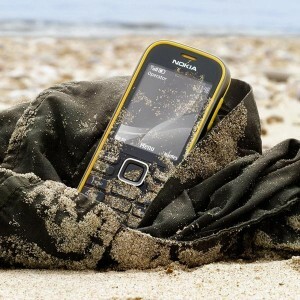 The back cover is protected against water and dust by a metal screw lock The 3720 Classic features a bright flashlight and Nokia Maps for S40. In addition, it is equipped with all the basic functions necessary to modern telephone: bright screen, a choice of decoration, a 2 megapixel camera, mobile internet access, customizable hotkeys, FM-radio, audio and video player, 20 MB of memory and built support card formats microSD. The Nokia 3720 is a Tri-band GSM device. The 3720 also has a 2.2-inch TFT display with a resolution of 240 x 320 pixels and a 2 megapixel fixed focus camera. Overall it's a really nice package that has some nice looks despite its ruggedized exterior. Designed for durability, the Nokia 3720 features a specially hardened casing to protect against knocks and scraps. Featuring rubber keys designed to resist dirt. A waterproof membrane protects external volume controls. Bluetooth connectivity allows you to connect the Nokia 3720 Classic to range of other wireless devices, while the 2 megapixel camera allows instant photo capture. An integrated FM radio allows you to listen to your favourite radio stations at a touch, while support for downloadable Java games and applications allows access to a wealth of applications.